First non-poker entry in my blog for, well, almost ever. Because today I actually left the house and, for brief moments, enjoyed the glorious sunshine. Somehow Claire managed to wake me up and get me to the station in plenty of time for my 7:24 – in the morning – train. I strolled out of Euston station before 9am thanks to a tilting train that only once threatened to spill my coffee, and didn’t. In the brief walk to Euston Square (I actually remembered this time that it was quicker walking a few hundred yards down the road to catch the Circle line than trying to change at Kings Cross) I basked in the glorious sunshine and fresh air. Apparently it’s been summer for a while now. Well, I’d suspected it as I’ve had to open my window a few times lately. 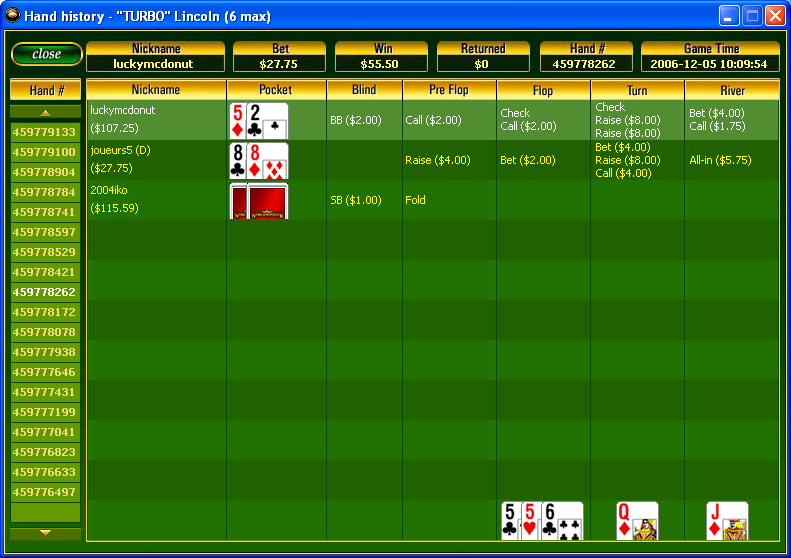 I was working at Gutshot today putting the last few features into their new online poker software. Ended up staying in the office until after 10pm, which at least answered the question of whether I was going to the card club tonight. It seems not. In any case, I’d been advised that Tuesday was “numpty night”. They have a similar amount of respect for their five quid rebuy tournaments to what I do for, well, almost any rebuy tournament. I am staying here a couple of nights to also try to start sorting out what’s happening with my disasterous server relocation. I was told last week that “oh, we’re not quite ready for you yet” but this only came on the day we were actually meant to move in and after nearly two weeks of daily prodding. Fortunately, I really hadn’t put that much faith in everything going to plan, and I was sadly proven right. With Vegas at just T-5, it’s not going to happen until September so we’ve got to do some housekeeping meantime. My usual cheapo hotel in Picadilly Circus was all booked up and I couldn’t even get in a Travelodge anywhere sensible, so I’ve ended up at the Belsize Park Hotel, thanks to some major Googling. On the plus side, there’s a fridge in the room. On the other hand, that’s about it. It took about half an hour to check in, with just one group in front of us who looked like they’d already lost the will to live. Mother argued that she wanted to pay by American Express or cheque, it turned out that just because those options were listed on the registration form didn’t necessarily mean they accepted them. Meantime teenage son loudly asked his mum whether whether she’d found the place on stigofthedump dot com. I chuckled, but also wondered whether he could possibly be old enough to remember Stig of the Dump, as I was at primary school when it was on TV, or if there’d been a remake. I finally got my key and was sent off on a bizarre adventure to find the room. Every door in the place is a fire door, and you just can’t tell whether you’re walking through into another part of the hotel or about to step out comedy style onto a sheer drop fire escape, requiring you to grab onto a ladder and flail about a bit. My room, 305, is on the third floor, which is logically located somewhere above the second floor. Although it’s not directly above it seems, and the floor is also split into two, with the second staircase is hidden behind yet another fire door on level 2. There should be a prize for getting to level 3, because it’s tough. Add to that the fact that one stairwell was pitch black – and of course the fire door swings shut quickly removing any light from the corridor below – and I was in big trouble. I found rooms 301-304 plus another room also labelled 301 (which was open, but had no bed) then after some more searching I found 306-312 up the second set of stairs. I had to go back and ask whether it actually existed because I sure as hell couldn’t find it and I thought that I’d probably already jumped through two Silent Hill dimensions, and that the stairs were probably only dark in one of them. He pootled off for a while and came back to tell me sorry there’s no light but he’d gone and opened the room door and turned the light on and if I went back up the dark staircase I’d see it, tucked away in a very dark corner. He’d also propped open one of the fire doors – with a fire extinguisher of course – which was helpful but I couldn’t help being a little afraid when I’m stuck at the top of this building on the eve of one of the hottest days on record and the fire doors are wedged open. I’d never find my way out anyway.